Timbre Concerts brings you Wild Child on their Expectations Tour with Guest Stelth Ulvang (of the Lumineers). Wild Child won't settle. For seven years now the Austin-based ensemble has carried its infectious blend of indie-pop and infectious melodies across the international music scene, charting viral hits and wrapping their arms around a diverse and dedicated fan base. But earlier this year when the band set out to make their fourth studio album, they found they had their hands full: After half a decade of maturation, the group had grown beyond its traditional writing and recording process. Now a seven-piece pop mini-orchestra (Wilson on violin and vocals; Alexander Beggins on ukulele and vocals; Sadie Wolfe on cello; Matt Bradshaw on keyboards, trumpet, and harmonica; Tom Myers on drums; Cody Ackors on guitar and trombone; and Tyler Osmond on bass), Wild Child formed in 2010 when the group's core duo of Wilson and Beggins wrote and released their first album, Pillow Talk. 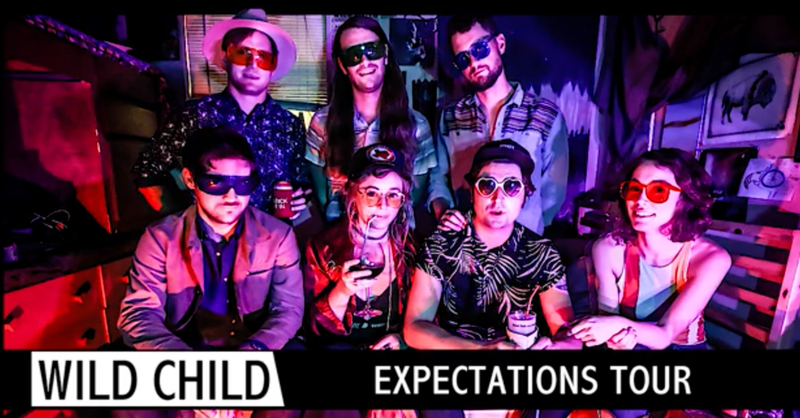 Wild Child shaped their last record, Fools, in the shadows of more than one failed love, and Expectations, as the title suggests, is a continuation of that personal experience into an awakening. Wilson and Beggins, whose voices fit each other as naturally as any family act, pushed their boundaries as writers, drawing freely from the stories they've lived as well as the artists around the world that have inspired their growth. Their rate of output over that last year got them thinking differently about producing, focusing on one track at a time. “We’ve always focused on the record as a whole. We wanted to think about each track as it’s own piece- but somehow it all fits together” Wilson says of the approach. That route took them around the world — from Chris Walla's (Death Cab For Cutie) studio in Tromsø, Norway, where the Northern Lights are the brightest in the world, to a home-built warehouse studio on the outskirts of Philadelphia, where Dr. Dog's Scott McMicken picked up the bass and “joined the band for a week,” arranging harmonies and sharing living and recording space. Back in Wimberley, Texas, Matthew Logan Vasquez (Delta Spirit) set up a makeshift studio in Kelsey Wilson’s beloved childhood home — abandoned since the floods of 2015 — where they found the muses were eager to resurface. The group also tapped the talents of frequent tour mate Chris Boosahda (Shakey Graves), Atlantic Records recording artist Max Frost, and Grammy-winning producer Adrian Quesada (Groupo Fantasma, Brown Sabbath, Spanish Gold). The result is a theater of possibilities, with arrangements that reflect the range of tastes of the producers, from scruffy lo-fi tape hiss, to smoothed out precision-cut electronic pop sounds. Smartly, the album avoids defining itself and kicks off with a child’s voice telling Alexander Beggins, "Don't think that way." The track that follows (called "Alex") is a hook-spangled opener which in its three breezy minutes builds from a single ukulele to a lush and playful arrangement reminiscent of Beirut. The record almost immediately settles in to find the band at its most expansive. Songs like "My Town" and the deep-breathing "Eggshells" stretch the spaces between beats like a Chinese finger/time trap. They stop for more than one layover in Detroit, with "Back and Forth" evoking the horn charts of Arthur Conley and Jackie Wilson (or even Jens Lekman), and "Think It Over" throws an unexpected nod to Sly and the Family Stone. And the more you listen to Expectations, the more the many worlds of this project begin to cohere around you. After all, one of the great joys of traveling the world is discovering surprising connections: A skyscraper in Barcelona reminds you of a spire in the Utah desert; the Northern Lights in the Norwegian sky look like an oil slick on the Philadelphia pavement. Expectations, an album which can by turns be bitter, wistful, angry, and flirtatious, is rich with these surprising rhymes across the record. “We’re all growing and changing and learning new tricks,” Beggins says. Wilson responds, “Yeah, there’s no right or wrong way to do anything.” Her own record, though, is proof she’s wrong.